This painting began as an abstracted aerial view of Tokyo, from Google Earth imagery. Some of the original "map" was left visible in the lower left. 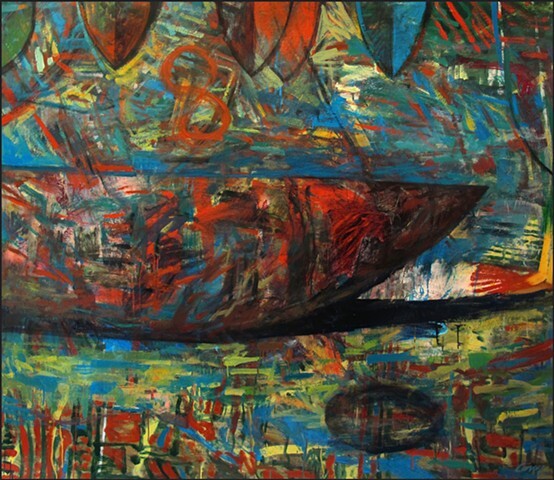 As always happens, the painting evolved away from its beginnings and the boat-like shape began to emerge from the paint. Enamel on heavy, gesso-coated paper. Framed with .75" wide x 2" deep gallery style natural wood frame. Framed size: 64" x 74". Price includes shipping in U.S. Terms available. Contact dongraystudio@yahoo.com for payment arrangements.